Glenn Harrold’ hypnosis audio series is one of the most successful in the world today, with sales and downloads on all formats now reaching the 2 million mark. Each hypnotherapy audio CD/MP3 features Glenn’s highly acclaimed hypnosis vocal delivery and production techniques, along with subtle background sound effects recorded in specific musical keys and frequencies. You can hear audio samples on each page before you make your purchase. Glenn has been producing hypnosis recordings for 15 years now and his titles are officially the UK’s best selling self-help CDs of all time. 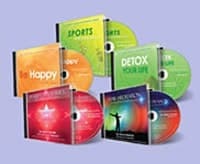 His Complete Relaxation CD is the number 1 best selling self-help CD in the UK of all time. In 2006 this title was awarded a gold disk by Nielsen Bookdata for sales in excess of £250,000. This is the only CD title ever to be awarded a gold disk in the self-help genre.